Hallmon, A. and Tapps, T. (2019) 'The value of strategic mentorship in park and recreation agencies', International Journal of Evidence Based Coaching and Mentoring, 17 (1), pp.34-45. DOI: 10.24384/9xnz-zr66 (Accessed: ). As professionals in the park and recreation field, we are regularly tasked with providing a diverse array of programming opportunities for a diverse constituency. As communities’ demographics have been changing since the late 1900’s, there has been a conceptual push to incorporate more inclusive practices within parks and recreation agencies (Anderson & Stone, 2005; Henderson, 1997; Holland, 1997; Poster, 2008; Kunstler, 1997; Wilson, 2000; Riley, Skalko, McChesney, & Glascoff, 1999). Inclusiveness involves the level to which individuals feel they are equitably represented and/or have the capacity to be involved in planning and decision-making practices (Allison, 1999; Allison & Hibbler, 2004; Dieser & Peregoy, 1998; Ebron, Sims, & Yang, 2011; Holland, 1997; Miller, Schleien, & Lausier, 2009; Washington, 1996). One way that inclusivity is measured is through the similarity in demographic compositions of communities and agencies that serve them. Furthermore, empirical studies have demonstrated increased levels of perceived inclusiveness when agencies’ staffing compositions are representative of the communities that they serve (Wallerm Costen, & Wozencraft, 2011; Lord & Elmendorf, 2008; Pitts, 2005; Bedini, Stone, & Phoenix, 2000; Roberts & Outley, 2002). This article will examine the implementation of a systematic mentorship programme through the perspective of the Illinois Parks and Recreation Association and how this strategic process could lead to better education and career advancement for future parks and recreation professionals to address the changing demographic trends. From my time as a professional, mentorship is an ambiguous process most often focused on rules and regulations rather than a strategic planning process. The main purpose of current mentorship programmes is to communicate which words and behaviours are legally and socially acceptable rather than cultivate future leaders. Eby, Butts, Durley, and Ragins (2010) further emphasized the ambiguity of mentorship and suggests that there needs to be further scholarship to better understand the potential positive and negative effects of this process. Still, their study did highlight the fact that mentorship is a developmental process where a less experienced and a more seasoned employee develop a relationship where the goal is for personal and professional development. If an organisation is strategically evaluating how employees are hired, develop, and eventually are promoted to higher level positions, mentorship is a viable option. Current research has indicated that strategic planning can be utilised to increase the diversity in a workforce and to increase the perception of inclusiveness in communities (Allison & Hibbler, 2004; Ebron, Sims, & Yang, 2011; Roberts & Outley, 2002). Some ways that this can occur is through purposeful recruitment, hiring, and training practices. Programmes geared at fostering appreciation for diversity can also promote perceptions of inclusiveness. Ongoing development and mentoring programmes have also demonstrated how they can assist in fostering inclusive practices. The United States health care industry and the military division currently use a formalised mentorship programme with the intended purpose of recruiting and retaining employees of these professions (Greene & Puetzer, 2002; Payne & Huffman, 2005). Greene & Puetzer (2002) and Payne & Huffman (2005) describe the use of mentorship to expose new members to their system and support them in delivering high-quality performance. Using this knowledge, professionals at the Illinois Parks and Recreation Association believed that the best training tool to increase inclusion was mentorship, thus they focused their attention towards creating a systematic mentorship programme. Friday and Friday (2002) and Agarwala (2003) state that organisational researchers and practitioners have recognised mentoring as a career development tool that can facilitate an individual’s career progression. The authors also make the argument that formal mentoring programmes have been used to augment diversity initiatives in many organisations but most have not strategically aligned their mentoring programmes with their long-term objectives and strategic positioning of their organisation (Friday & Friday, 2002, pg. 1). With the escalating competition for high quality and functioning employees in today’s competitive business environment, there needs to be more integration of effective mentoring strategies, processes, and programmes into the workplace culture of an organisation to remain competitive (Friday & Friday, 2002, pg. 1). Mentoring can help to communicate job-related skills and to foster relationships with stakeholders (Riley, Skalko, McChesney, & Glascoff, 1999; Bedini, Stone, & Phoenix, 2000; Roberts & Outley, 2002; Allison, 1999). Without a proper mentorship process to help foster relationships, research has indicated that minority populations may not perceive recreation agencies as being inclusive (Ebron et al., 2011; Waller et al. 2011; Henderson, 1997; Anderson & Stone, 2005). For example, people of colour may perceive that front-line recreation staff is the only level where they are likely to encounter other individuals who "look just like them" (Ebron et al., 2011). This may also influence the educational and employment decisions of people of colour. The purpose of this study was to ascertain the benefit of a systematic mentorship programme for recreation agencies through a case study with the potential benefit of recreation agencies becoming more diverse. Given that census projections in various states indicate significant changes in relation to age, gender, and racial composition, these demographic markers were chosen as variables to assist in focusing the study related to mentorship. Education achievement and certifications were included to gauge what were the most prevalent degrees and certifications among agencies. The results would provide context as to the usefulness of a systematic mentorship programme for future parks and recreation professionals, and to gain knowledge about mentoring practices that are occurring among member agencies. An organisational assessment survey was developed in order to obtain information on recreational agencies' staff compositions and agency practices. Data was collected using an online survey tool (Survey Monkey) to acquire organisational demographic information about the responding agency. The Statistical Package for Social Sciences (SPSS) was used to analyse descriptive statistics. The survey asked participants to discuss mentoring and their organisation’s staff demographics. Demographic questions included age, education, gender, and professional certifications. Aggregate demographics provided information of all positions indicated by respondents. Percentages were calculated based on the number of people who belonged to a particular group that, respondents indicated, filled specific positions in each of the three administrative levels. They were then compared to the aggregate data of the total number of people who belonged to particular categorical groups across all three administrative levels. Board of Directors/Administrative Managers provided information for individuals at the upper-most level of administration. Supervisory/Entry-Level Managers provided the demographics of those identified as mid-level managers. Part-time/Other Employees provided information for those who serve as volunteers, and part-time employees. In each of these sections, descriptive statistics are provided related to race, age, education, gender and certification. There was no perceived additional risk for participating in the study. Participants were provided with a consent form before they were able to complete the survey and they were allowed to not answer questions that they felt uncomfortable responding to, or to leave the survey. All participants were of legal age to be a full-time employee of their organisation. As well, there were no direct benefits to the participants in this study. Organisational information was collected from respondents without identifiers, which prevent me or others from knowing who had or hadn’t responded to the survey. Responses were typed and recorded in Survey Monkey by the participant and subsequently downloaded by the researcher to SPSS. Two hundred and thirty-eight (238) recreation agencies, who were current Illinois Park and Recreation Association members, received emails that stated: the purpose of the study; a portable document file (PDF) attachment of the survey; and contact information for questions/concerns related to the survey. Executive Directors and Human Resource managers were the main recipients of this survey, due to their access to demographic information of the organisation, hiring practices, and training procedures. Of the 238 individual agencies represented in the Illinois Park and Recreation Association, 54 recreation agencies submitted responses via Survey Monkey. The response rate of 22.7% is within the acceptable parameters for an online collection of data. Fifty-nine respondents answered survey questions related to mentoring. Almost half of the respondents (49%) indicated they did not have a mentor programme at any level. Eleven respondents indicated they did have a mentoring programme, but offered no explanation of what the programme entailed or who was served by it. Nine respondents indicated they had a mentoring programme specifically for supervisory/entry-level managers. Five respondents, roughly 9%, indicated they had a mentor programme for their part-time/other employees. 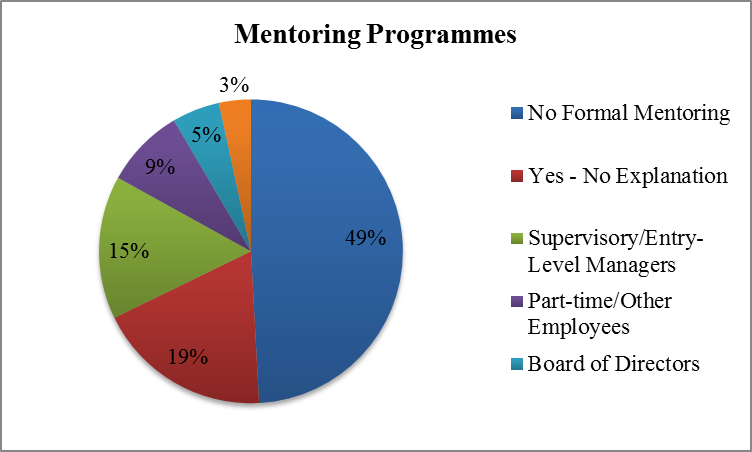 Three respondents stated they had a mentor programme for their Board of Directors, and two stated that they had a mentor programme for their administrative managers, as set out in Figure 1. The survey asked respondents to describe their definition of mentorship. Commonly stated words or phrases associated with mentorship included: being professional, providing, and guiding. Based on responses there did not appear to be a universal understanding of what mentorship was, or how it was practiced. In order to situate the demographics of the participants, it is helpful to understand the composition of the state that they serve. According to the 2012 Census, women accounted for 50.9% of Illinois’ population. Almost 57 percent (56.7%) of the population was between the ages of 18 and 65. More than three quarters (77.8%) of the population was White, 16.3% was Hispanic/Latino, and 14.8% was Black or African American. Individuals who identified as Asian only accounted for five percent of the state, and American Indian and Alaska Natives accounted for less than one percent (0.6%). The Census indicated that of individuals over the age of 25, 87% had completed high school or more education. Roughly thirty percent (31.1%) indicated having earned a Bachelor’s degree or higher. Given that 77.8% of Illinois’ population indicated it was White, it is not surprising that recreation agencies were primarily staffed by individuals identified as Caucasian (86%). 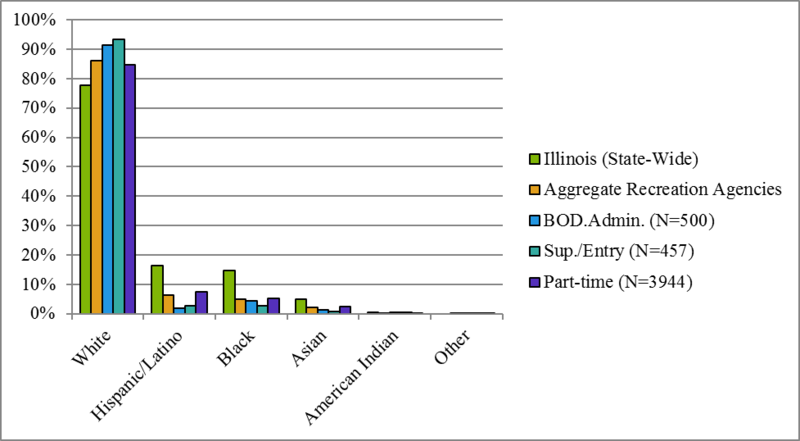 However, while roughly a quarter (22.2%) of Illinois’ population identified as something other than White, only 14% of staff members were not White among responding agencies. This contrast was even more apparent at the levels of Board of Directors/Administrative Manager (8.6% non-white) and Supervisory/Entry-Level Manager (6.8% non-white). Of the 4,901 positions listed by responding agencies, 86% were filled by individuals identified as Caucasian. Individuals identified as Hispanic/Latino comprised roughly six percent (6.4%). Those identified as African American accounted for roughly five percent (4.9%) of staff membership. Individuals identified as Asian/Pacific Islander (2.1%), Native American (0.3%) and other (0.2%) accounted for less than three percent of the responding agencies’ staffs. Demographics according to race/ethnicity are shown in Figure 2. Respondents did not provide answers to all questions about their staff members' demographics. Percentages were calculated based on the number of people who belonged to a particular group that respondents indicated held specific positions in each of the three administrative levels. Aggregate data compares the total number of people who belonged to particular categorical groups across all three administrative levels. Compared with aggregate demographics, the Board of Directors/Administrative level was the least racially diverse and more individuals identified as Caucasian. This level was also more highly educated, older, and had earned more certifications. Of the 500 positions identified as being either part of the Board of Directors or an Administrative Manager, less than ten percent (8.6%) were filled by individuals identified as not Caucasian. Ninety-one percent (91.4%) of individuals in this level of administration were identified as Caucasian. This was the only administrative level where individuals identified as African American (4.4%) accounted for a greater percentage of the staffing than those labelled as Hispanic/Latino (2.0%). Eleven of the 500 positions were filled by individuals identified as Asian, Native American and Other. Of the 457 positions identified as Supervisory/Entry Level Managers, 426 were filled by individuals identified as Caucasian. African Americans and Hispanic/Latino individuals each accounted for roughly three percent (2.63%). Asian American (0.9%), Native American (0.4%), and Other (0.2%) were not significantly represented in this level. 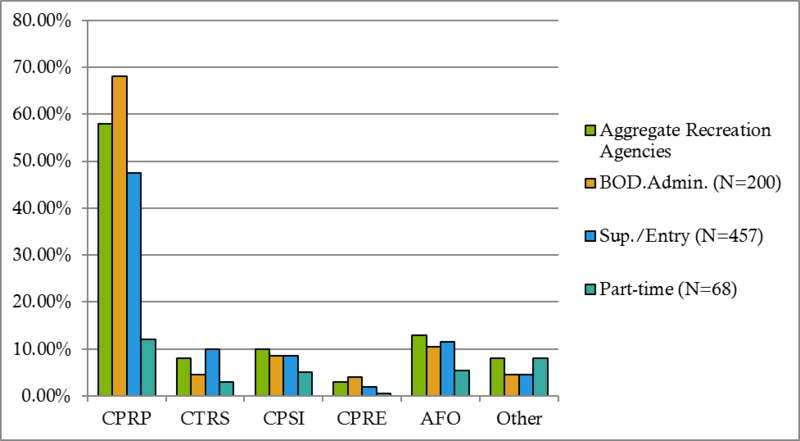 The part-time/other employee level in many ways was the most diverse level of staffing among the responding agencies. This was the largest of the three levels with almost 4,000 positions being identified. This is the only group where women were the majority. It also was the most racially diverse of all administrative levels. It was also the youngest and least educated group. Of the 3,944 positions identified in this group, 3,335 were filled by individuals identified as Caucasian (84.6%). Hispanic/Latino (7.4%) and African American (5.2%) were the second and third most common racial designations. Of the 4,918 positions listed by responding agencies, more than half (2581) were filled by individuals between the ages of 18 and 34. Individuals between the ages of 35 and 54 comprised roughly thirty percent (29.2%) of employees. Only two percent of positions were filled by individuals 75 years old or older. The 505 individuals identified at the Board of Director (BOD)/Administration level, which accounted almost fifty percent (49.3%), were between the ages of 35 and 54. However, in contrast to the other two levels of administration where younger populations accounted for more positions than older individuals, more than forty percent (45%) of this level was comprised of individuals older than fifty-five. Individuals between the ages of 18 and 34 comprised only six percent (6.1%) of this group. 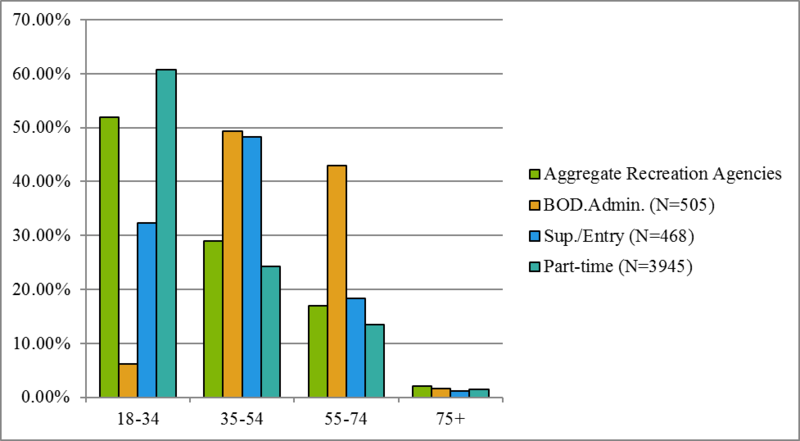 The 468 positions identified in the Supervisory/Entry administrative level were comprised primarily of 35 to 54 year olds (48.29%). Unlike the Board of Directors/Administrative Manager level, individuals over the age of 55 comprised less than twenty percent (19.5%). Instead, more than thirty percent (32.3%) of this group was between the ages of 18 and 34. The youngest of the three administrative levels was the part-time/other employee level. The majority of the 3945 positions were filled by individuals between the ages of 18 and 34 (60.8%), followed by 24% who were between the ages of 35 and 54. The demographics according to age are set out in Figure 3. Responding agencies were highly educated when compared to Illinois’ general population. Almost thirty percent (29.5%) of the 4351 positions listed were filled by individuals with a Bachelor’s degree or higher. The Board of Directors/Administrative levels were more highly educated, older, and had earned more certifications than any other staffing level. Of the 786 responses, almost sixty percent (59.1%) indicated that the individual had earned a Bachelor’s degree or higher. Roughly a quarter (24.8%) indicated that the highest degree earned was a high school diploma. Supervisory/Entry Level Administrators were less educated than the Board of Directors/Administrative Manager level, but more educated than the Part-time/Other Employee level. 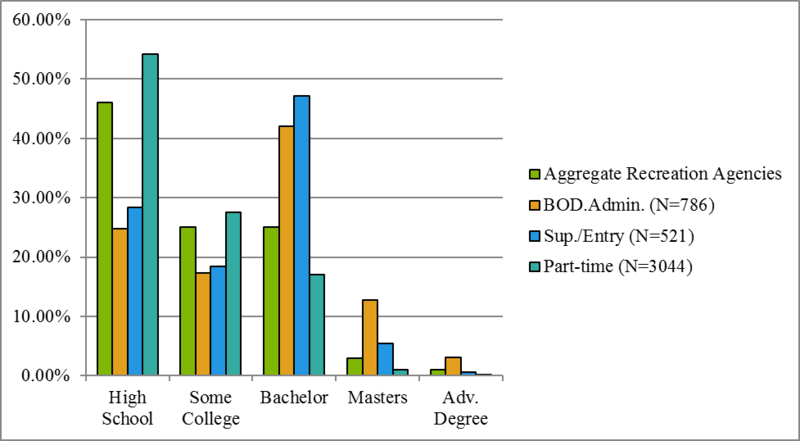 Of the 521 responses, 246 indicated that the individual had completed a Bachelor’s degree. Only six percent of this level’s managers had earned a Master’s degree or higher. As one might expect of the youngest group, this was also the least educated. Of the 3,044 responses, 1651 indicated a high school or equivalent degree. Roughly seventeen percent (17.1%) had earned a Bachelor’s degree. Less than two percent (1.1%) had earned Master’s or advanced degrees. Demographics according to education are set out in Figure 4. Of the 4,904 individuals whose gender was identified, 51% were male and 49% were female. It is worth noting that at the part-time/other employee level women account for more of the staff than men; however, at highest level of administration the percentages change dramatically with women only accounting for 32% of Board of Directors/Administrative Managers positions. Compared with aggregate demographics, this administrative level was comprised of more men. Unlike the other two administrative levels (Supervisor/Entry and Part-Time) that were within a few percentage points of equality, in the Board of Director/Administrative group men outnumbered women two to one among the 492 positions indicated. Men accounted for roughly sixty-eight percent (67.7%) of the positions. At the part-time employee level, there was an almost equal distribution of males and females in this level. Males comprised a slight minority (48.4%), while women represented a slight majority (51.6%) of the 3,959 responses. One individual identified as other in this group. Demographics according to gender are set out in Figure 5. Respondents indicated that their staff had earned 436 certifications. The most commonly earned certification was the Certified Park and Recreation Professional from NRPA. This certification accounted for more than half of all certifications earned. Individuals at the Board of Directors/Administrative level had earned 200 certifications. The most common was certification was the Certified Park and Recreation Professional (68%). Of the certifications earned, Aquatic Facility Operator accounted for roughly ten percent (10.5%), and Certified Playground Safety Inspector accounted for roughly nine percent (8.5%). Most of the 168 certifications earned by Supervisory/Entry level of managers were Certified Park and Recreation Professional (47.5%). Twenty-three had earned certification as Aquatic Facility Operator, 20 were Certified Therapeutic Recreation Specialist, 17 as Certified Playground Safety Inspector, and four had earned Certified Park and Rec. Executive. Among employees at the part-time level, only 68 certificates had been earned. Twenty-four of them were Certified Park and Recreation Professional. Eleven had earned Aquatic Facility Operator certification; ten had earned Certified Playground Safety Inspector. Demographics according to certification are set out in Figure 6. 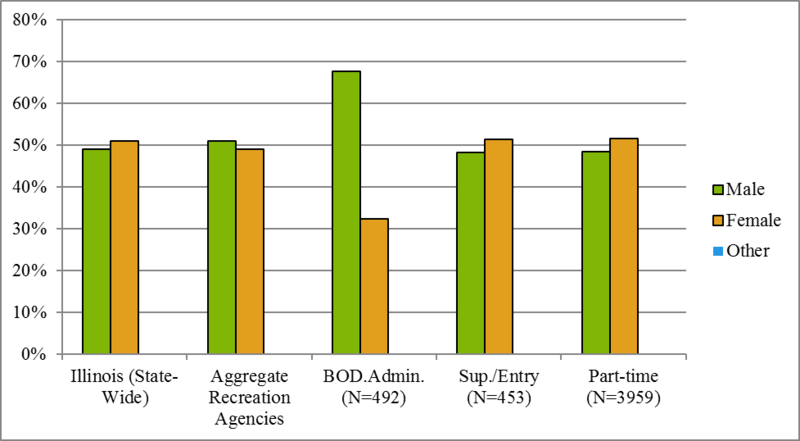 Based on the respondents’ information, and particularly based on their responses to the questions regarding mentoring, it does not appear that recreation agencies are systemically engaged in strategic planning, programming, training or mentoring to foster inclusiveness and encouraging minorities to move up into higher administrative positions. Some agencies are engaged in specific practices focused on diversity and inclusiveness, but due to the number of respondents, it is not possible to state with certaintity to what degree recreation agencies are, or are not, engaging in purposeful practices to promote inclusiveness. Flory, Leibbrandt, Rott and Stoddard (2018) and Friday and Friday (2002) describe that organisations have a variety of ways to increase diversity within the workplace, which includes mentorship, as long as the organisation is able to clearly communicate their goals and the outcomes that they seek to achieve. Having a well thought-out purpose and structure for increasing diversity would require an organisational shift and focus towards expanding their formalised recruiting and retention approach. The Illinois Parks and Recreation Association felt that organisations needed a tool to be intentional in recruiting and retaining diverse professionals to the parks and recreation field. Considering the demographics of the responding agencies and knowing that recreation majors would need to complete a 10-12 week internship to graduate, there is an opportunity to attract and retain diverse employees throughout the state with an intentional approach. When we consider that the health care industry in the United States (U.S.) and the U.S. Army serve a diverse population and they use mentorship in a formalised way to train their employees to interact with their constituents, it gives an example that mentorship could be just as beneficial for the parks and recreation field (Greene & Puetzer, 2002; Payne & Huffman, 2005). What makes mentorship effective in the context of the U.S. Army and the nursing profession is that mentorship is a formalised process. Schneider, I. E. & Kivel, B. D. (2016) discuss in their book the need to have a more formalised way of training our employees to be more inclusive and culturally competent but they did not have a definitive answer as to the solution. Using mentorship as that solution, the hope is that agencies will be convinced to require a formalised mentorship process in their strategic plan. Currently, the Illinois Parks and Recreation Association is providing a mentorship programme to all state parks and recreation agencies to determine if this is the best approach to diversifying the parks and recreation field in Illinois. Such discussions could be used to guide future hiring practices, training and development that contribute to creating more inclusive spaces. With better understanding of what employees desire in the way of mentorship, recreation agencies would be more efficient in strategic planning and training. Through these discussions amongst recreation professionals, it may be possible to establish best practices for mentoring. This could allow recreation agencies to systemically engage in mentoring practices that better facilitate inclusiveness. As an organisation, the Illinois Parks and Recreation Association recognised that current systems in place were not leading to the inclusive representation at various levels of administration at recreation agencies. Using data that they obtained about the current demographics of their affiliates they developed a mentorship process that would combine a junior professional, mid-career professional, and a seasoned professional in a cohort format. This structure allowed each individual to learn from the others whilst passing on their own experiences. This model was chosen in order to create an atmosphere where it is assumed that no particular individual has all of the answers, but that at each level of professional experience we are continuing to learn and grow. This prevents the continued ideology that only younger professionals could learn from senior professionals and opens the possibility for a 360-degree relationship. The following are potential outcomes that could be created from this process. Literature suggests that major students only discover recreation after arriving on campus (Bedini, Stone, and Phoenix, 2000). A systemic mentoring effort could be made to actively recruit students, especially women and individuals of colour, into undergraduate recreation programmes. Agencies could continue to actively engage with high school and college populations to demonstrate the wide range of positions available in the recreation field. Developing mentorship programmes and recruitment strategies to educate, inform, and recruit diverse undergrad students could increase perceptions of inclusiveness. State-wide efforts of park and recreation agencies could be made to systemically recruit high calibre young people into the recreation industry. Data could be used to better understand current demographics of recreation organisations, which could lead to a more effective focus on developing future leaders of parks and recreation who are representative of their demographic. There is a lot of information that has been provided on the workforce demographics, but often the statistics are outdated or not representative of our profession. Providing more relevant data on potential staff demographics could give insight on how to effectively recruit more diverse candidates. Current practices in recruitment have been created based on previously held ideals and beliefs, which has led to several advancements. Sadly, the pace of change has diminished possibly due to the belief that there is no need to be intentional in recruitment and emphasise change. Responses to this survey suggest that there are many different definitions of mentorship being practiced by responding agencies. This could contribute to unfocused and inefficient training that could be made more efficient and effective through more strategic training and development. Having constructive discussion about mentorship within the classroom could elicit recommendations related to recreation agencies creating mentoring programmes spanning the three levels of administration. Data suggest that some agencies have implemented comprehensive mentoring plans at certain levels of administration. Such plans offer opportunities to prepare individuals to better fulfil their current duties and to move into higher levels of administration (Allison & Hibbler, 2004). Educating students as to how to implement such practices systemically would benefit not only single agencies, but also the entire recreation profession. Working through the classroom with park and recreation students, could encourage sharing of ideas and develop effective programmes once they graduate and secure employment in recreation agencies. Another recommendation is that agencies shift from one-time diversity training to a model of ongoing cultural competency training and development with their full-time and part-time staff. The motivation for doing so would be to increase the perception of inclusiveness among current employees. Cultural competency training and development not only communicates terminology and laws, but also facilitates opportunities to gain appreciation for the similarities and differences in and among cultures (Anderson & Stone, 2005). This type of training and development has been demonstrated to affect the programmatic and policy development practices of agencies. Working with students to be educated through a cultural competency model could facilitate collaborative work designed to implement state-wide certifications and ongoing training and development with the intended purpose of serving their diverse constituents. Due to the number of respondents, it is not possible to state with certaintity to what degree recreation agencies are, or are not, engaging in purposeful practices to promote inclusiveness. Clearly, some agencies are engaged in specific practices focused on diversity and inclusiveness. However, based on the respondents’ information, there are still segments of the recreation industry that could benefit from students educated in systemmic strategic planning, programming, training, development or mentoring to foster inclusiveness. While the findings from this project are not generalisable, they do provide examples for students to understand and consider trends and conversations related to mentoring, staff compositions, and inclusiveness. Importantly, there are other characteristics that may be equally or more salient in given communities that have not been considered here, but students may be able to see. One final limitation is that workforce diversity can be measured using a wide range of variables: race, ethnicity, gender, age, sexual orientation, nationality, ability, social-economic status (SES), social class, political affiliation, religion, and/or educational achievement. As a profession, we are continuing to move forward yet the perception that Ebon, Sims, and Yang (2011) highlighted in their study is still cognizant today. People of colour and women are under-represented in crucial park and recreation positions within the United States. From previously conducted mentorship studies, we see other human service industries using mentorship as a strategic tool to recruit, train and retain high quality, functional, and diverse staff members. The idea is that the Illinois Park and Recreation Association could have similar results through developing a formalised mentorship programme. Using the recommendations provided and taking an active role in either recruiting minority recreation majors or training majors with a cultural competency approach to mentorship could led to systemic mentoring and training to close the gap currently experienced in recreation organisations. Community needs are constantly evolving and park and recreation professionals need to stay actively engaged with their constituents’ changing needs. Focusing on park and recreation organisation demographics and how to effectively mentor employees to address this need is an approach that will continue the relationship building process, whilst educating the next generation of professionals. Agarwala, T. (2003) 'Innovative human resource practices and organizational commitment: An empirical investigation', International Journal of Human Resource Management, 14(2), pp.175-197. DOI: 10.1080/0958519021000029072.Allison, M.T. (1999) 'Organizational barriers to diversity in the workplace', Journal of Leisure Research, 31(1), p.78. DOI: 10.1080/00222216.1999.11949852.Allison, M.T. and Hibbler, D.K. (2004) 'Organizational barriers to inclusion: Perspectives from the recreation professional', Leisure Sciences, 26(3), pp.261-280. DOI: 10.1080/01490400490461396.Anderson, D.M. and Stone, C.F. (2005) 'Cultural competencies of park and recreation professionals: a case study of North Carolina', Journal of Park and Recreation Administration, 23(1).Bedini, L.A., Stone, C.F. and Phoenix, T.L. (2000) 'Increasing diversity among students in recreation, parks, and leisure studies curricula: A case study', SCHOLE: A Journal of Leisure Studies and Recreation Education, 15, pp.47-62. DOI: 10.1080/1937156X.2000.11949455.Dieser, R.B. and Peregoy, J.J. (1998) 'Research Update. Multicultural Training in Parks and Recreation Programs', Parks and Recreation, 33(3), pp.37-47.Ebron, C., Sims, C. and Yang, H.W. (2011) 'Profiles and perceptions of workplace diversity among park and recreation professionals', LARNet-The Cyber Journal of Applied Leisure and Recreation Research, 13(1).Eby, L.T., Butts, M.M., Durley, J. and Ragins, B.R. (2010) 'Are bad experiences stronger than good ones in mentoring relationships? Evidence from the protégé and mentor perspective', Journal of Vocational Behavior, 77(1), pp.81-92. DOI: 10.1016/j.jvb.2010.02.010.Flory, J.A., Leibbrandt, A., Rott, C. and Stoddard, O. (2018) Increasing Workplace Diversity: Evidence from a Recruiting Experiment at a Fortune 500 Company. Munich: CESifo Group. No. 7025.Friday, E. and Friday, S.S. (2002) 'Formal mentoring: is there a strategic fit? ', Management Decision, 40(2), pp.152-157. DOI: 10.1108/00251740210422820.Greene, M.T. and Puetzer, M. (2002) 'The value of mentoring: A strategic approach to retention and recruitment', Journal of Nursing Care Quality, 17(1), pp.63-70. PMID: 12369749.Henderson, K.A. (1997) 'Diversity, Differences and Leisure Services. 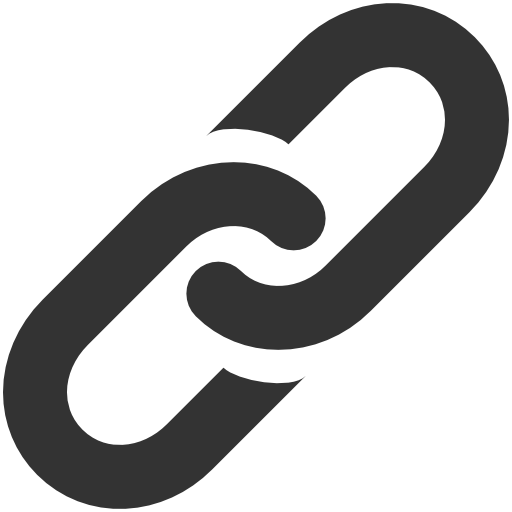 Research Update', Parks and Recreation, 32(11).Holland, J. (1997) 'Enhancing Multicultural Sensitivity through Teaching Multiculturally in Recreation. Research Update', Parks and Recreation, 32(5).Kunstler, R. (1997) 'Matching staff and client characteristics: a public-public partnership as a response to cultural diversity', Journal of Park and Recreation Administration, 15(4), pp.79-91.Lord, B.E. and Elmendorf, W.F. (2008) 'Are recreation organizations representative of all participants? ', Journal of Park and Recreation Administration, 26(1).Miller, K.D., Schleien, S.J. and Lausier, J. (2009) 'Search for best practices in inclusive recreation: Programmatic findings', Therapeutic Recreation Journal, 43(1), p.27.Payne, S.C. and Huffman, A.H. (2005) 'A longitudinal examination of the influence of mentoring on organizational commitment and turnover', Academy of Management Journal, 48(1), pp.158-168. DOI: 10.2307/20159647.Pitts, D.W. (2005) 'Diversity, representation, and performance: Evidence about race and ethnicity in public organizations', Journal of Public Administration Research and Theory, 15(4), pp.615-631. DOI: 10.1093/jopart/mui033.Poster, W.R (2008) 'Filtering Diversity A Global Corporation Struggles With Race, Class, and Gender in Employment Policy', American Behavioral Scientist, 52(3), pp.307-341. DOI: 10.1177/0002764208323509.Riley, B., Skalko, T., McChesney, J. and Glascoff, M. (1999) 'Learn and serve: integrating elements of social learning theory and cross cultural exposure in professional preparation', SCHOLE: A Journal Of Leisure Studies & Recreation Education, 14(1), pp.55-68. DOI: 10.1080/1937156X.1999.11949440.Roberts, N.S. and Outley, C. (2002) 'Innovation and Resourcefulness: Recruitment and Retention of a Diverse Staff for the 21st Century', Parks & Recreation, 37(4), pp.39-47.Waller, S.N., Costen, W.M. and Wozencraft, A.J. (2011) 'If we admit them, will they stay? : understanding the role of social connectedness in the retention of African American students in a recreation and leisure studies program', SCHOLE: A Journal of Leisure Studies and Recreation Education, 26(1), pp.26-1. DOI: 10.1080/1937156X.2011.11949670.Washington, D. (2010) 'Moving to understanding and change', Policy, Politics, & Nursing Practice, 11(2), pp.158-163. DOI: 10.1177/1527154410377357.Washington, R.E. (2000) 'Recreation Services in a Multicultural Society', Journal of Park and Recreation Administration, 18(3).Washington, S.J. (1996) 'Diversity education for professional practice', Journal of Physical Education, Recreation & Dance, 67(2), pp.42-44. DOI: 10.1080/07303084.1996.10607201. Augustus W. Hallmon, Ph.D. is an assistant professor in the School of Health Science and Wellness. He volunteers regularly at park districts, YMCA's and Boys and Girls clubs. Tyler N. Tapps, Ph.D. is an associate professor in the School of Health Science and Wellness. He has served on multiple boards in the parks and recreation industry.